Lived and died in Pa., leaving two children, who were bound to farmers, in that State. Married ____. 2 JOSEPH (2) b. Jan. 18, 1810. 3 JOHN S. (2) b. June 18, 1811; d. Aug. 8, 1878. Buried in the Glenwood Cemetery, Smyrna, Kent County, Delaware. John (1). Born June 18, 1811; d. August 8, 1878 at Black Bird Hundred, Delaware; m. Mary Atherley in Philadelphia, Pa. on November 21, 1847. She was born in England May 2, 1823, coming to America when two years of age. She died March 11, 1898 of pneumonia. After his death, Mary is living with her son, John Atherley Latta. 4 JOHN ATHERLEY (3) Born in Delaware August 12, 1848; d. January 28, 1920. 19 RACHEL - b. abt. 1847 in Delaware. 20 MARY C. - b. abt. 1854 in Pennsylvania. John S. (2) John S. (1). Born in Delaware August 12, 1848; d. January 28, 1920; m. Rachel Cannon in Philadelphia, Pa. November 15, 1869. She was born in 1846. He was reared and educated in Morristown, Pa. After his death, Rachel is found in the 1930 census, living with daughter Reba. 5 JOHN EDWARD (4) b. Sept 1, 1870 in Pennsylvania. 6 WILLIAM AUBREY (4) b. Nov. 8, 1885 in Delaware. 9 MARY NEVIT "Minnie" (4) b. abt. 1873 in Pennsylvania; d. abt. 1880; m. Thomas Purnell Lewis. Lived at Wilmington, Del. Their children were Edna, Mary and Merritt. 10 BLANCHE CANNON (4) b. August 3, 1876 in Smyrna, Duck Creek Hundred,Kent County,DE; d. aft. 1930; m. James Lockerman. Lived at Smyrna, Del. In the 1930 Smyrna, Kent County, Delaware Census, Blanch Lockerman, boarder, F W 48 wid is living at the Delaware Hotel on Main Street and is listed as DE PA DE cook hotel. Also found is Mildred, her daughter, age 17, waitress. Also found is her sister, Bulah Brother, 45 wid, DE PA DE and Andrew, nephew, M W 15, S DE DE DE. 11 BEULAH GORDON (4) b. Oct. 12, 1880 in Black Bird Hundred, New Castle Co., Delaware; d. in 1955; m. Thomas Brothers. Lived at Townsend, Del. She is buried in the Glenwood Cemetery in Smyrna, Kent County, Delaware. 12 REBA (4) b. March 12, 1892; m. William Figley Greer on June 19, 1912 near Smyrna, Kent County, Delaware. In 1931 lived at New Castle, Del. 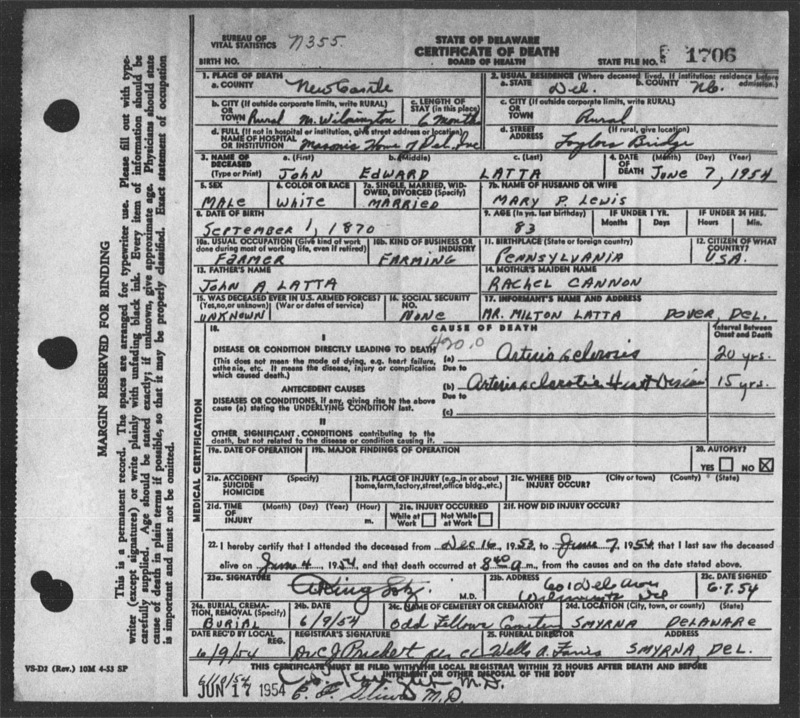 William Figley Greer worked in the steel mill, and in the 1940 census, he is a foreman. Their children are Reba and William Aubrey. John A. (3) John S. (2) John S. (1). Born November 8, 1885 at Townsend, Del. ; m. Florence Miller Booz who was born at Philadelphia, Pa. September 26, 1884. In 1933 she lived at 113 S. Chestnut Street, Lansdale, Pa.
15 WILLIAM HENRY (5) b. October 5, 1915 at Smyrna, Del. Twin with John A.; there is a William H. Latta listed in the phone book at Townsend, Delaware in 2004. 16 VICTOR HEBERT (5) b. October 6, 1922 at Lansdale, Pa.; d. Jan, 1986 in Lansdale, PA (SS Index) There is a Dennis Latta and a Doris Latta listed in the phone book at Lansdale, PA in 2004. A brother-in-law of Mrs. Florence Latta says that J.A. Latta's cousins were named Schaefer. John E. (4) John A. (3) John S. (2) John S. (1). Born April 26, 1849 at ____; m. Fanny Frances December 24, 1917. She was born in 1900 and died in 1989. In 1933 living at Marshalltown, Del. They are buried in the Odd Fellows Cemetery, Middletown, New Castle County, Delaware. 18 VIRGINIA FRANCES (6) b. 1922; d. 1952. Married Burton Pershing Voss. Buried in Odd Fellows Cemetery, Middletown, New Castle Co., Delaware.